If you made it back here, I can't thank you enough for visiting my site. I really do try to keep the info interesting and as accurate as I can. Most of the information I pass along is based on sharpening related items that I have personally learned and much of them through trial and error and mistakes. I want to pass on an important one that I don't have pictures of but I know folks can relate too, people learning to sharpen or in that matter, people who really know what they are doing. It is something I learned a few years ago so I will share it here. Naturally I will throw in some random shots that I took, this first one is of three Shun knives that live in a professional kitchen, just some tip work. I do most of the major tip work on a belt sander, I find that I can actually do a better job and then I finish it off on water stones. I work from the spine of the knife towards the front where the tip used to be and then just keep adjusting the width of the front of the knife to form a new tip. Some folks work from the edge of the knife and move the blade in a direction that forms a new tip, I don't. The lesson I want to pass along is an issue with bevel consistency and how I learned to correct it. 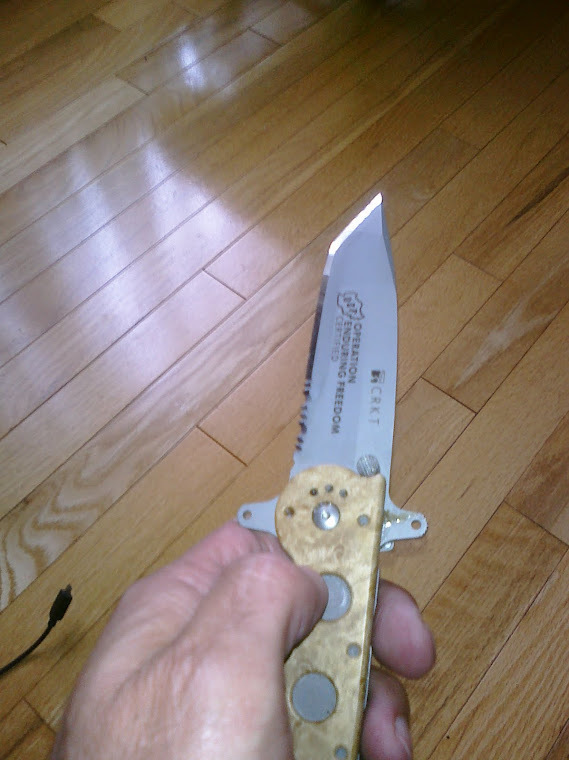 I have seen many many brand new knives sharpened by experts with one of the bevels a little wider than the other side. 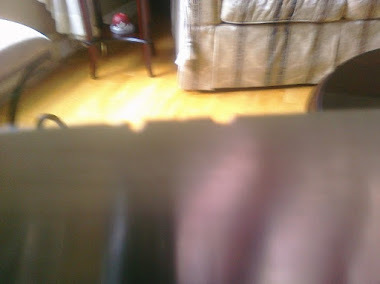 I have done this myself, after sharpening on one side of the knife to raise a burr and then flipping the knife to form another burr on the opposite side. The bevels were consistent, i.e. running parallel, nice and even but the width of the bevels, i.e. from the Edge up was a little, and I mean a little but wider one one side than the other. So how is this happening? 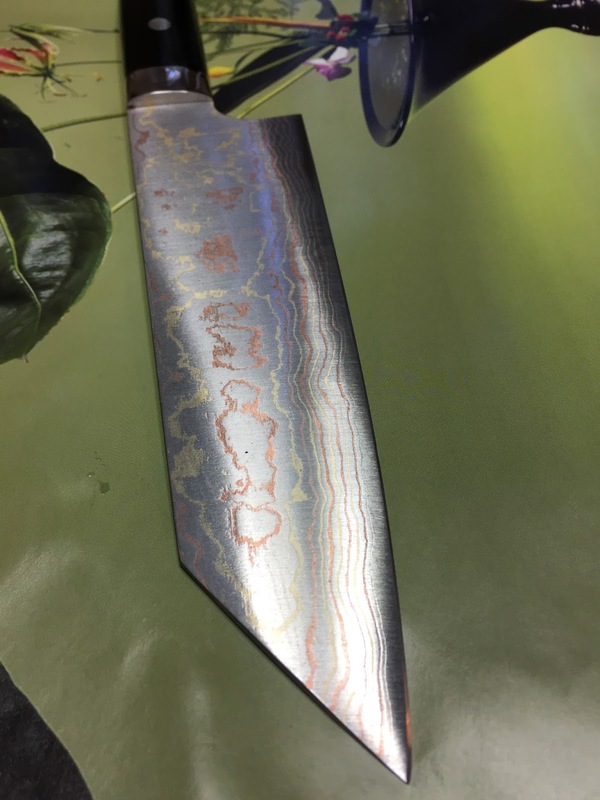 You may have seen this yourself, both of your bevels not being exactly the same width, the knife is sharp of course but it just looks a little off. Again, the Bevel Line so to speak can be nice and even, but just not the exact same width. NOW, having said this, this is not a big deal, we are human after all, so perfectly matched bevels are not a significant issue but for me, it was an issue, I didn't like it. 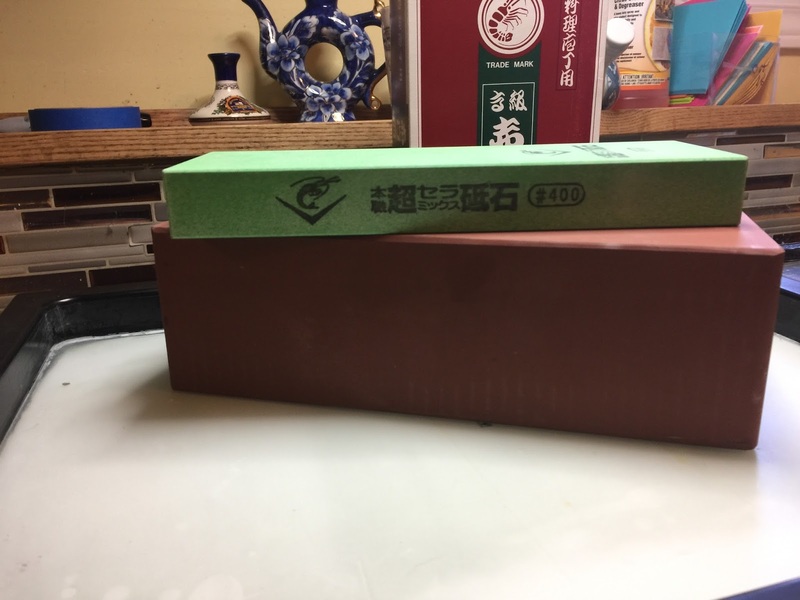 New Water Stone, the XL Naniwa Akamonzen 1,000. This thing is huge, it's fantastic. 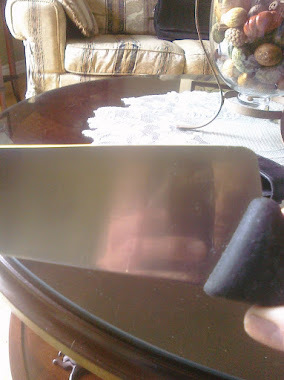 A few years ago when I was using the Edge Pro on a knife I noticed that one bevel was a little wider than the other. I wasn't sure how this was happening since I assumed the issue was ANGLES, i.e. I was sharpening one side at a slightly more acute angle than the other, even a degree, that is what I thought at the time and this is what I believe most people think. However, if I was using an Edge Pro with perfectly matched angles on either side, how was this happening? The problem is not just Angles, yes they have to be close of course, but a degree or two of difference on either side is not the problem, there are other, just as important variables that need to be taken into account and they are all easy to focus on and work on. However, all these things come into play and I do believe that Angles are the most important followed very closely by Time and Pressure. In my case, I noticed this during the Burr forming stage. 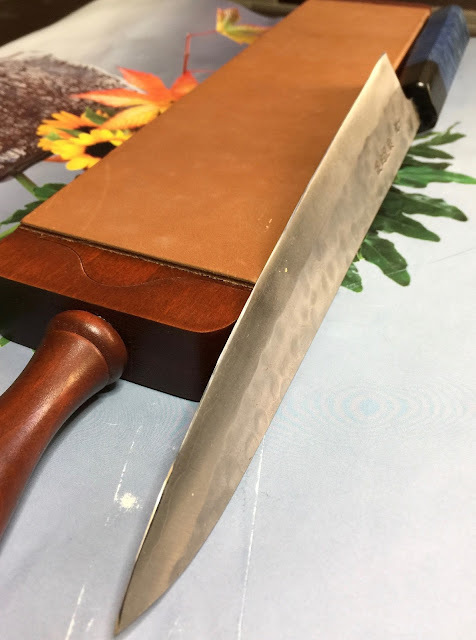 I would spend some time on one side of the knife with a coarse stone and sharpen (grind) at my sharpening angle until the burr was formed on the other side. Then I would flip the knife and form a burr on the opposite side. 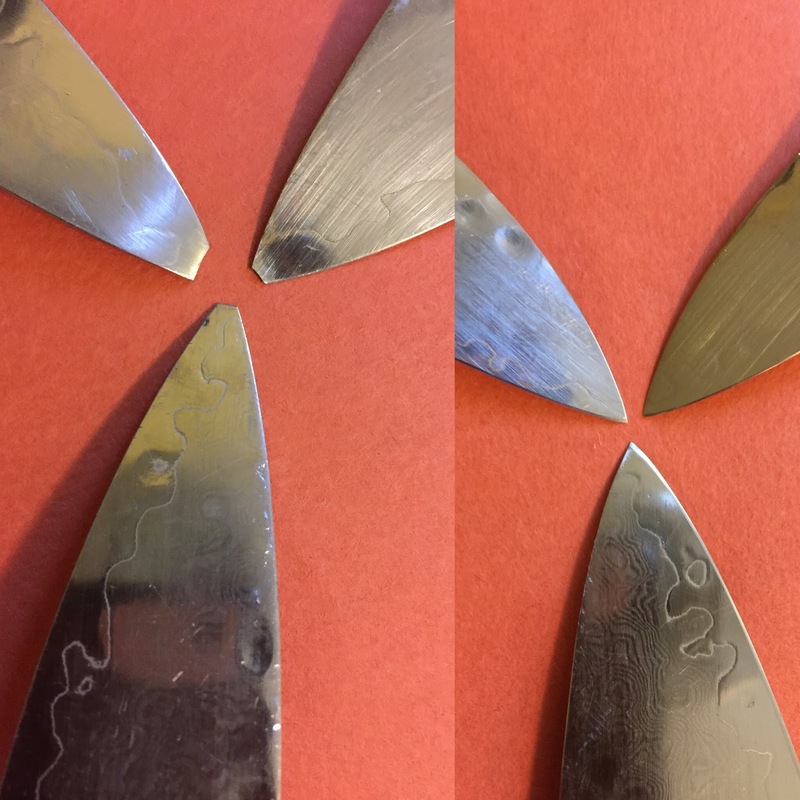 HOWEVER, as is often the case, that second burr comes at a faster rate than the first one so I was spending more time on one side of the knife than the other, on some knives. This happens to me a lot actually, I always find that when I am in the burr forming stage and using Pressure Level 4, that it takes longer to form that first burr than it does when I flip the knife. When I am just starting with a knife and I am going for that first burr on a 400 grit stone (Just and example, it could be a 220 or 500 grit stone). If I notice after a couple of minutes that the burr is NOT formed I flip the knife and grind on the other side, I do this until the burr is formed, i.e. grinding as evenly as possible on each side of the knife. That pretty much solved the entire problem for me. At the end of the day, just do your best and as long as you keep these things in mind I think you will see your consistency levels increase, I did anyway. Started the new year by sharpening a knife this am and was thinking about this subject as well. I tend to sharpen the first side I choose more than the other. Maybe I should start using an egg timer. I recognized your new stone. I had bought the smaller brother of the Akamonzen 1000 in Japan last year. Not as big as yours but almost twice the thickness of my Naniwa Pro 400. The price on the box was 2100 yen, about 23.00 Cad.Keep up the blogs. Hi, thanks for reading and yes that stone is awesome, I paid about 90 dollars with tax but it will last a few years at least. As far as the egg timer goes, I don't think you need to do that. As long as you are aware of it, you will make the necessary adjustments. I was doing the same thing, sharpen the right side longer because it took me longer to form that first burr. Compensating for it is easy and the best thing to do is keep a good eye on the bevels, check frequently. 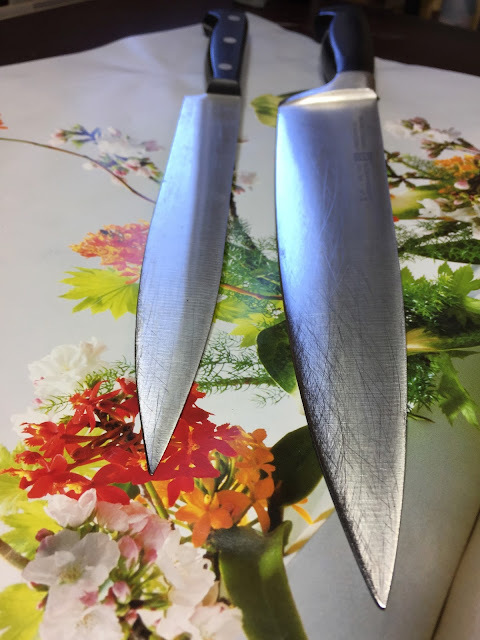 I have had knives from master sharpeners in my hands with the same thing going on so it isn't a novice issue, it is a matter of monitoring our work and grinding evenly.